ViewMSX is one of those examples how one project can lead to another. When I first joined Team Bomba to work on our upcoming game Blox, I had no way of viewing the G9B graphics of the game since I don't actually own a GFX9000. I soon started working on ViewG9B, my very own G9B viewer for Win32. Initially, ViewG9B was to be a Team Bomba production. Team Bomba however, were not impressed and basically told me to stick it where the sun don't shine. A few more beta-versions later, ViewMSX was born and released on www.msx.org by yours truly. As time went by I added more and more functions, and ViewMSX grew into quite the handy little app, with support for over 25 different MSX filetypes. As of now, ViewMSX can view more than 25 different MSX filetypes, including of course G9B, which is how it all started. 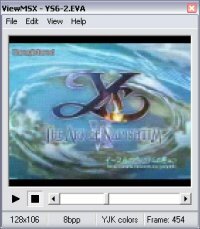 As of version 0.04, ViewMSX can even view EVA movies on most Win32 PCs, and even has support for the new cross-platform .SGX/.VID SymbOS files. A nice feature of ViewMSX is the ability to associate files with the viewer, and the ability to drag and drop files onto the program or the executable. This makes quickly checking an MSX picture in one of your many directories a breeze. Other than that, you can also use ViewMSX to quickly 'rip' some of your MSX graphics by saving them as a bitmap, or copying them to the clipboard. This can be particularly handy if you want to edit something on your PC. For more detailed information on ViewMSX, just check the readme file in the ViewMSX package. For some nice G9B example files, be sure to check the G9K library section. Curious what ViewMSX looks like? Check out the screenshots below. You can see ViewMSX displaying a G9B file and a .EVA movie. 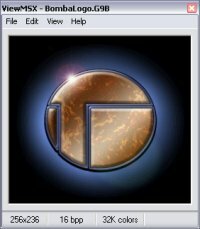 The zip file contains the Windows program, a manual and an example G9B file.